Former Aviation Minister, Femi Fani-Kayode has reacted to Supreme Court ruling sacking Ali Modu Sheriff as the National Chairman of the Peoples Democratic Party, PDP. 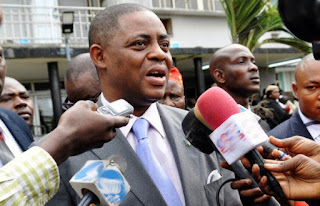 Fani-Kayode in a tweet on his social media handle said “shame on Sheriff” PDP is back in the right hands. “Praise the Lord! God has given us victory at Supreme Court. PDP is back in the right hands. Shame on Ali Modu Sheriff! Congrats to PDP!,” he wrote. Recall that the apex court had earlier put an end to the lingering leadership crisis rocking the opposition party. In a landmark judgment, the apex court held that Markafi remains the authentic National Chairman of PDP and consequently sacked Sheriff. The Supreme Court also ordered Sheriff to vacate the National Secretariat of the party. PDP has been experiencing leadership crisis since it lost the 2015 presidential election. The crisis, however, heightened earlier in the year when an Appeal Court in Port Harcourt, Rivers State affirmed Sheriff as the National Chairman of the party while sacking the Makarfi’s Caretaker Committee.